Welcome to my first installment of strategy guides for operation bosses in the Terror From Beyond. I opted to start on the hard mode version since more guilds will probably find difficulty with these fights compared to story mode. I will point out the differences between hard and story modes as well as the mechanics that need to be brought to your attention. Angry Spittle – Tank the boss facing away from the operation group to avoid this AoE damage. Corrosive Slime – This is a random DoT that will be placed on an operation member that ticks for about 2500 every 3 seconds. A green tinged highlight will cover your avatar when you have the debuff. It should be cleaned, but doing so will drop a yellow circle on the ground that needs to be avoided. In order to do so efficiently, make sure that you cleanse away from the battlefield and near the edges of the map. Jealous Male – This add will appear 3 to 4 times during the encounter, depending on how long the fight goes on for. The tank that is on the boss will need to taunt this guy and the offtank will need to pick up the boss. This mob has a frontal knock back so keep it facing away from the operation group with your back to the wall if possible. Foul Offspring – These adds will appear soon after the Jealous Male. The number of adds depend on how many stacks of incubation are on the main tank at the time the Jealous Male appears. Anywhere from 3-8 is typical. 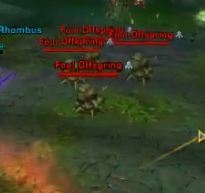 They can be gathered together for easy and fast AoE using the Calming Pheromones buff. Calming Pheromones/Stale Pheromones – This buff and debuff is obtained by standing in the red circles that will appear next to the mushroom clumps throughout the room. Doing so will attract the Foul Offspring to that player where they will take significantly reduced damage while the adds are AoE’d down. 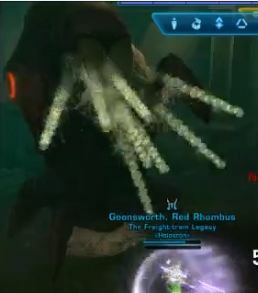 Be careful not to step out of the red circle prematurely or you will gain the Stale Pheromone debuff preventing you from gaining any benefit from the red circles again. This persists through the duration of the encounter. Make sure that the Jealous Male is not tanked facing the player in the red circle or they can be knocked out and the Foul Offspring will run rampant throughout the operation. 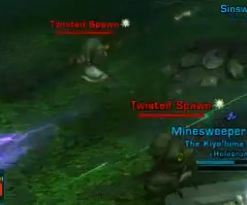 Twisted Spawn – These adds show up at the last 10% of the fight. They should be picked up by the offtank and held until the boss is killed. DPS will ignore these adds and focus fire on the Writhing Horror. Once the boss dies the Twisted Spawn will die as well (causing no damage). Assign a rotation for the Calming Pheromone buff ahead of time. Healers can be assigned the role as well. Thanks for posting this, Ghoztt. The tip about moving to the edge when you get a cleanse was helpful. What are you using in your UI to track your dps output–the white box in the video? That looks like a helpful tool I may want to grab. The combat tracker that we use is called Memories of Xendor (or MoX for short). It can be found at memoriesofxendor.com and is pretty easy to install. In order to collect the most accurate data you will have to have everyone in the operation group run it. It takes the combat logs of everyone running it and streams it to the MoX server that will then parse the data into an understandable format and push the information to each person running the client. Some people are afraid of these numbers but I feel they are essential in progression operations, especially with strict enrage timers like the ones in TFB. Thank you for the information, Ghoztt.